I noticed that this film didn't end up on the Best Films of the 90s list - Kore-eda's 1998 "After Life" did (another masterpiece, but a flawed one) but I was saddened by the fact that this film (which I consider the best film of the 90s and one of the best films ever made) wasn't included. This film - for my money the best so far in Kore-eda's rich career - deals with death and the effect it has on those that the deceased leaves behind. The story follows a young woman named Yumiko, who lives in Osaka with her husband Ikuo and their infant son Yuichi. Yumiko is haunted by a traumatic experience in her childhood - as a young girl, tasked with watching over her senile grandmother, she is careless and lets the old woman wander off. Her grandmother is never seen again, and Yumiko believes that she died soon after wandering off, and that she is responsible for the old woman's death. Yumiko and Ikuo have a great relationship - they love each other dearly and both seem very happy. However, one day Ikuo is found dead - he was walking on train tracks and was run over in what appears to be a suicide. Yumiko is completely devastated by her husband's death and confused by his manner of passing. She falls into depression. A few years later, Yumiko's aunt acts as match-maker, finding a new husband for her niece. This man, whose name is Tamio, is a widower and father of a young daughter who lives in a small fishing village on the western coast of HonshÃ». Eager to escape the oppressive city life, and all the memories of Ikuo that it carries, Yumiko moves with him to the house he shares with his father and daughter in the fishing village. Yumiko and Tamio's relationship is distant at first, but they soon learn to rely on and confide in each other. Yumiko forms a connection with her father-in-law and with an elderly fisherwoman who lives in town. However, she's still unable to escape thoughts of her husband's inexplicable suicide. Meanwhile, her son and her stepdaughter become close friends and spend the days playing in the fields and lakes near the village. One evening her new husband comes home drunk, and he gets into an argument with Yumiko. She confesses that she cannot understand the feelings she's experiencing regarding her husband's death, and he says that he feels the same regarding his wife's. Some time later, Yumiko travels to the seaside and sees a funeral procession carrying a body to a pyre by the shore. She follows them, drawn to the strange ceremony. After the procession is gone, she lingers at the funeral pyre until sunset, when Tamio comes to find her. She breaks down, crying out that all she wants to know is why her husband killed himself. Tamio replies that his father used to see "maboroshi no hikari" (illusions of light - 'will-o-wisps') at sea when he was fishing, and that perhaps Ikuo was drawn to the tracks, and to death, by some force that cannot be explained or accounted for. A few days later, Yumiko sits with her father-in-law on the deck of the house. He comments on the weather - 'It's getting warmer, isn't it?'. She agrees. "Maboroshi no Hikari" is, using Herr-Schreck's definition, a perfect example of mise-en-scene. The cinematography itself (some of the best and most beautiful I've ever seen) tells the story as clearly as the actors and the script do. Like Ozu, the camera is normally static, but unlike Ozu shots are captured at a variety of angles, including several notable (and incredibly beautiful) crane and vista shots. In Osaka, and especially after Ikuo's death, the camera seems preoccupied with the idea of tunnels - often we are facing down a narrow street lined with tall buildings, down a hallway or even down a tunnel itself. The use of natural light gives the scenes in the city a feeling of melancholy. Indeed, every aspect of the visuals reflects Yumiko's inner emotional state - just as she is trapped by grief and confusion, our view of the film is trapped in tunnels, passages and alleys. When we arrive at the fishing village, this effect is not as prevalent but still definitely noticeable. We see the fishing village shot from an angle that makes the bay enclosing it seem almost cagelike. The style of the cinematography changes when we entire the p.o.v. of another character - in the most notable case, Yuichi and his stepsister. We see them play in several different locations - including a tunnel, but in this case there's a difference. We are facing the tunnel mouth, beyond which there is an almost heavenly vision of lush, brilliantly green wilderness. As the children move towards this, we see a contrast between the wide-open world of their imagination and the cage-like world of Yumiko and the other adults. This contrast is repeated in another, absolutely stunning image - one where the children play by the side of a pond. Again we see the world of the children and their imagination, and the world of the adults and their pain, placed side by side. The "real world", the grown-up world - the top half of this image - is almost completely obscured by a dark, dense forest. 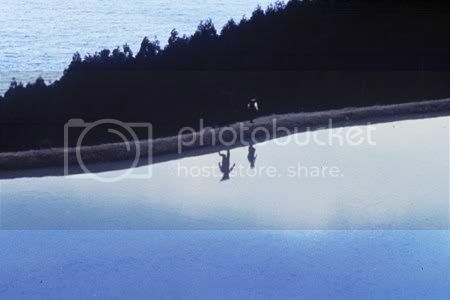 But Yuichi and his stepsister are reflected in the pond, which looks as blue and as open as the sky itself. "Maboroshi no Hikari" is full of images of similarly breathtaking beauty. The film is shot primarily in longshot, with several medium shots and only one close-up to be found. This, again, emphasizes Yumiko's disconnect from life following her husband's death, and the distance she feels from her new husband. This approach makes the performances by Esumi Makiko (who plays Yumiko) and the other actors quite interesting. They can't chew the scenery in close-up, so they must resort to expressing their characters' emotions in key scenes through vocalization. Esumi's line readings in the drunken argument scene and in the scene at the funeral pyre are heartbreaking, shattering and completely illuminating. The beauty and emotional power of this film really can't be expressed through words. It is a shame that this film isn't more widely praised - perhaps it is just underseen compared to some of KorÃªda's later work (such as After Life and Nobody Knows). But it is an essential film in his canon, an essential film of the 90s and an essential film of both Japanese and world cinema. If you have ever lost someone close to you, this is a must-see: it is perhaps the best, most powerful and most satisfying film about grief and healing that has ever been made. puxzkkx wrote: I noticed that this film didn't end up on the Best Films of the 90s list - KorÃªda's 1998 "After Life" did (another masterpiece, but a flawed one) but I was saddened by the fact that this film (which I consider the best film of the 90s and one of the best films ever made) wasn't included. I placed this film at #1 on my 1990s list, and several others voted for it as well, but it just did not have enough support. My guess is that relatively few people have seen it, as I cannot recall it getting any negative reactions/reviews on the board. Now that the awful New Yorker disc is OOP, what this film desperately needs is a release by a label with greater resources and a wider reach. Criterion, are you listening? this is probably my favorite kore-eda film. nobody knows gives it a huge run for its money. didn't he have a new one come out called distance? need to see that. back to maboroshi... its such a shame that such a lovely film has been represented so badly on dvd. even the japanese one on the beav looks not so good. i wish criterion or moc would pick up some kore-eda (especially this film and make it look presentable). I think it is a testament to Nakabori Masao's fantastic cinematography that it is so impressive even on such a terrible transfer. A Criterion release of this would be a dream come true. ehimle wrote: back to maboroshi... its such a shame that such a lovely film has been represented so badly on dvd. I have the Japanese disc and I can tell you that it is beautiful and miles ahead of the New Yorker disc. I would be happy for someone--anyone--to take the Bandai transfer and put it out in R1. The other film you mention, Distance, is from 2001 and has a lovely Bandai release that is well worth tracking down. Hana is available in R1, but the others you mention are not (yet). I have not seen Air Doll, but I can wholeheartedly recommend the others. If you thought Mabarosi showed traces of Ozu, just wait until you see Still Walking. It just might be his best film of the 2000s so far (with Distance a close second). Very nice write up puxzkkx! Sadly I have not seen Maborosi yet (only After Life and Nobody Knows) but have often wanted to see more of his work. The New Yorker DVD was based on Milestone's print (as I recall). Milestone basically _begged_ the Japanese rights holder to let them make create a fresh internegative (or was it an interpositive) from the negative (which was being used to strike new prints). Milestone's pleas were rejected. Thus one ca not fault either MIlestone or New Yorker for the DVD. Happily, the owners of the film eventually work up and did some restoration -- and the result was the utterly gorgeous Japanese DVD (which does have subtitles). No reason not to buy this -- unless you are enslaved by a R1-only player. Distance is not a new film -- but it has never been distributed in the US (and never will be). It makes the "mistake" of trying to understand terrorists in human terms. Hana yori no maho is a wonderful film -- not sure why I garners so little love. good to know a little bit more about distance. its also good to know that the japanese bandai disc of maborosi is better than what i thought the captures on beaver looked like. i do have a region 2 player (not a region free) and have hana on r2. the only problem is those japanese dvd always cost an arm and a leg. how are these other films? air doll and still walking? are they on dvd too? it does make me happy to know there are three kore-eda films i haven't seen yet. he sure is one of the few in recent years that is constantly good. Still walking is out on DVD in Japan (with subs). Air Doll presumable will show up eventually -- not sure whether this has even begun screening in Japan yet, however. I am utterly biased when it comes to Kore'eda. I'm going to tell you they are all wonderful (because I believe that to be the case). I think Air Doll premiered in Japan right after it showed in Un Certain Regard at Cannes this year - so it should be out on DVD there soon. If Still Walking doesn't make it to a theatrical release in the USA, I'm pretty sure Air Doll will. Air Doll actually goes into wide release in Japan starting September/October, so a DVD is still probably a couple of months away. Still Walking has actually been picked up for US distribution by IFC (according to an indiewire article I read in like March or something) but whether that means it goes to their on-demand thingy, theatrical release, or both, I have no idea. . .
And now there is a trailer available. As mentioned above, the (significant) faults of the US DVD were not due to either Milestone or New Yorker. Good to hear there is now a first-rate print. Saw this again the other day and loved it as much, if not more, than I did the first time. Although I got something small but quite important wrong in my writeup - Esumi's character is the one who says "It's getting warmer, isn't it? ", not her father-in-law. So this is more of an affirmation of her new feelings of closure and hope than a realization of them. Once again I was struck by the way Kore-eda's restraint throughout most of the film made the stunning climax (Esumi following the funeral procession and meeting her new husband on the beach) even more of a jaw-dropper. Watched it on VHS this time - the only copy I could find in NZ!!!! - so the print was even worse than the New Yorker transfer (of course). But the cinematography is still impressive. puxzkkx wrote: Watched it on VHS this time - the only copy I could find in NZ!!!! - so the print was even worse than the New Yorker transfer (of course). But the cinematography is still impressive. I strongly recommend that you save up your pennies in order to get the R2 DVD from Japan. This was actually a rental, not a bought copy. But getting the R2 is a goal of mine. Great store, too. The only video store in the entire country that stocks Ordet, apparently. Has anyone here recently bought the Bandai edition of Maborosi, which YesAsia lists as available. I would love to have a good edition of the film and am wondering whether to bite the bullet, despite the exorbitant price, but don't want to place an order and go into a waiting limbo. I have the New Yorker edition, but it is very poor. Has anyone heard any rumours of any imminent releases of this film? It surprises me that Criterion haven't done it. The Japanese DVD is indeed subtitled and looks gorgeous -- a huge difference from the US DVD. (Note -- the rights holder would not let Milestone make an inter-positive from the negative -- which was being used to make all prints, just like in the bad old days -- and New Yorker was forced to use the same crummy source for its DVD that Milestone was forced to use for its theatrical prints. Happily someone later convinced the rights holder that the film _should_ be protected and restored). Last edited by Michael Kerpan on Sat Jul 16, 2011 7:58 pm, edited 1 time in total. I, too, have the Bandai release and would recommend it highly. You can find screen captures and a comparison to the New Yorker disc here, in case you need visuals to help you make your decision. I just came across an edition of Maborosi that I haven't found before. I have the New Yorker one and it's terrible. Does anyone know anything about this edition, or what the quality of the transfer is like? No idea on that specific title, but I've found Trigon to be a quality label. I started a Trigon thread a little while back. Last edited by Lemmy Caution on Mon Sep 26, 2011 10:22 pm, edited 3 times in total. Le Feu Follet wrote: I just came across an edition of Maborosi that I haven't found before. I have the New Yorker one and it's terrible. The only other subbed DVD currently available is the (excellent) Japanese release (currently $50 over at Yesasia, the cheaper Korean DVD is now O/P). Historical note: The (undeniable) low quality of the New Yorker DVD was not New Yorker's fault, the Japanese rights holder wouldn't make anything better available at that time. Michael Kerpan wrote: The only other subbed DVD currently available is the (excellent) Japanese release (currently $50 over at Yesasia, the cheaper Korean DVD is now O/P). Yes, I'm aware of the Japanese Bandai edition, and I know it's the one to have, but it is very expensive and although YesAsia.com don't say it's out of print, other sites, such as CDJapan, do say it's out of print, so I have my doubts. I'm tempted to take a punt on the Trigon one, but it would be disappointing to end up with the transfer that I already have (New Yorker), but in different packaging! I very much doubt that the Trigon will be anything like the New Yorker DVD. New Yorker had to use a rather abused hard-subbed (I believe) exhibitiion print for its DVD. Since then, the film has been fully restored -- so I'm sure the Trigon DVD would be related (in some way) to the current Japanese materials.